The first section of freeway to open in Texas was a portion of what would become IH 45 south of Houston on September 30, 1948. The 285-mile long highway provides an essential link between the Gulf Coast and the central plains of Texas, connecting Galveston, Houston and Dallas. IH 45 was also the first completed freeway in Texas when the final piece opened to traffic between IH 30 in Downtown Dallas and IH 20 in Hutchins in 1975. IH 45 begins its northwest course on Galveston Island, quickly leaving the island city on a causeway toward Texas City. Once beyond La Marque, the freeway enters the greater Houston metro area at League City. IH 45 continues its beeline northwest toward Houston as the Gulf Freeway, passing by NASAs Johnson Space Center and Ellington Field. IH 45 meets the Sam Houston Tollway (Beltway 8) near the Southbelt/Ellington neighborhood en route to Hobby field and IH 610 (South Loop Freeway). Once inside the IH 610 beltway, the Gulf Freeway continues IH 45 northwest through the East Downtown and Midtown sections of Houston. Beyond a multi level interchange with IH 69 and U.S. 59, IH 45 curves around the west side of Downtown on an elevated viaduct, meeting IH 10 north of Buffalo Bayou. The two share a brief overlap before separating along the Katy (IH 10) and North (IH 45) Freeways. Beyond IH 610 (North Loop Freeway), IH 45 continues as the North Freeway between the Northside and Northline neighborhoods toward the northern loop of the Sam Houston Tollway (Beltway 8). Opened by 1983, the Hardy Toll Road parallels the North Freeway to the east, providing a connection to George Bush Intercontinental Airport (IAH). North of Beltway 8, IH 45 generally carries ten lanes, which it retains to Exit 83 north of The Woodlands. The Woodlands is one of the Houston areas most predominent suburbs, home to over 100,000 residents and several large corporations. IH 45 runs along the eastern section of the area while SH 99 (Grand Parkway) borders it to the south. The Hardy Toll Road also reaches its end at IH 45 to the south of the area limits. IH 45 continues north to Conroe, county seat of Montgomery County, before commencing a 200 mile drive through rural territory. Beyond New Waverly, IH 45 passes through the Sam Houston National Forest, home to the Piney Woods of East Texas. Huntsville lies to the north of the national forest, and was the home of Sam Houston. A 67 foot statue memorializing the first president of the Republic of Texas (1836) faces Interstate 45 between Exit 109 (Park Road 40) and Exit 112 (SH 75). Huntsville is also home to Sam Houston State University. Continuing north and northwestward, Madisonville represents a dividing line between the pine trees that populate the southeastern portion of the state and the oak trees that spread across eastern parts of the Lone Star state. As IH 45 pushes north from Madisonville toward Richland, forestland gives way to open fields. Once at Richland, IH 45 briefly turns northeasterly before resuming a northwest trek to Corsicana. Corsicana is home to the first of four business loops along the IH 45 corridor. U.S. 287 joins IH 45 south of Corsicana for an overlap to Ennis. Interstate 45 leads away from the north end of Business Loop I-45 outside Corsicana to span Old Channel and Chambers Creek. 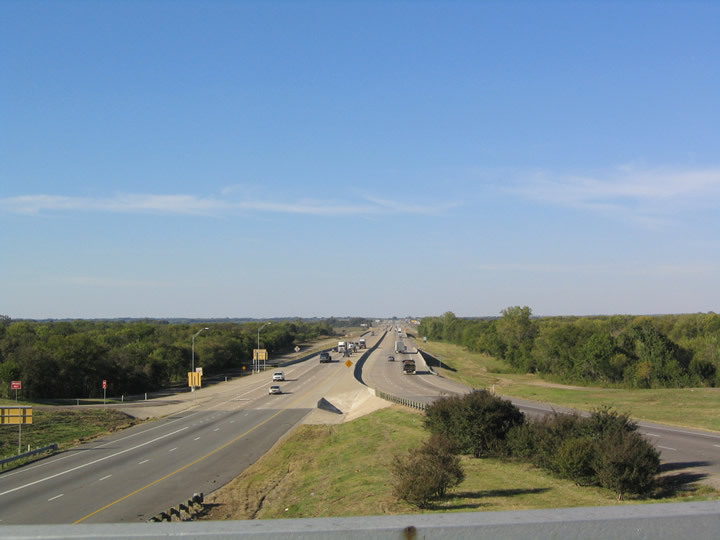 This portion of IH 45 replaced both U.S. 75 & 287. Photo taken October 21, 2003. IH 45 enters the metro Dallas area from Ferris and Wilmer to the southeast. Portions of I-45 along this stretch were reconstructed and widened in the late 1990s. The IH 45 freeway meets IH 20 (Lyndon B. Johnson Freeway) on the north side of Hutchins before entering Dallas proper. The Julius Schepps Freeway takes IH 45 north of the Trinity River crossing and Loop 12 to an impressive view of the Dallas skyline on the final stretch. IH 45 comes to an end at a stack interchange with IH 30 east of Downtown Dallas, while U.S. 75 begins its trek through the Dallas metro area along the North Central Expressway toward Oklahoma. Unsigned IH 345 lines the first 1.4 miles of the North Central Expressway to Spur 366 northeast of Downtown. IH 45 replaced U.S. 75 between Galveston and Dallas. The last remaining section of US 75 was between Fairfield and Streetman, and had become quite dangerous by the time of replacement in 1971. 1948: The Gulf Freeway opens from Scott Street in downtown Houston to Telephone Road. 1951: Freeway extended south from Telephone Road to present-day South IH 610 in Houston. 1952: Gulf "Freeway" extended south to Galveston. However, the freeway name is a misnomer as only the first 8.5 miles from downtown south are limited access - the rest of the road has at-grade crossings. 1955: West side of downtown Houston from Allen Parkway to Pierce St opened. 1959: IH 45 corridor established. Huntsville loop bypass open. From South IH 610 to Alameda Mall in Houston, expressway upgraded to freeway. Crosstimbers Road to Parker Road opened in Houston. 1960: Hardy Toll Road to Conroe opened. Streetman to Corsicana and Corsicana to IH 20 opened (Corsicana bypass not yet complete). 1961: North IH 610 to Crosstimbers Road open in Houston. Beltway 8 to FM 1960 open north of Houston. Conroe to Huntsville opened. 1962: From Pierce St in downtown Houston north to North IH 610 opened. 1964: Galveston Causeway reconstruction completed. The new causeway consists of dual three lane bridges. Expressway upgraded from Fuqua Street to FM 1959 in Houston. 1965: Freeway extended north from Huntsville to Madisonville. 1967: Pierce Elevated between Pierce St and Scott Street opened in Houston, completing the link downtown. Freeway opened from Madisonville to Centerville. 1969: Centerville to Buffalo opened. 1970: Expressway upgraded from FM 1959 to NASA Route 1. 1971: Buffalo to Fairfield opened. October 13, 1971: Fairfield to Streetman opened. This is the last link of freeway between downtown Houston and IH 20 to open. 1975: Freeway completed from IH 20 to downtown Dallas. 1976: Upgrade NASA Route 1-FM 1764. Freeway complete from downtown Houston to Galveston and completed in Texas. During the 1980&apos;s, IH 45 was reconstructed from South IH 610 to North Beltway 8. During the 1990&apos;s, IH 45 was upgraded from South IH 610 to FM 1959 and Beltway 8 to the Woodlands, as well as from Ennis north to IH 20. Construction in 2005 along Interstate 45 included upgrades near Streetman as well as reconstruction of the Galveston Causeway. Slotbloom, 2003, "Houston Freeways", p. 118-128 (downtown Houston), p.144-162 (Gulf Freeway), p. 217-225 (North Freeway).